There haven been countless royal affairs over the centuries but few have captured the people's imagination as much as the love affair between Queen Caroline Mathilde of Denmark and court physician Johann Frierich Struensee. She, the sister of King George III of Great Britain married to the mentally ill King Christian VII of Denmark. He, the son of the priest and enlightened reformer who became the de-facto regent of the King of Denmark introducing countless reforms which abolished torture, unfree labor, censorship of the press, and many more. 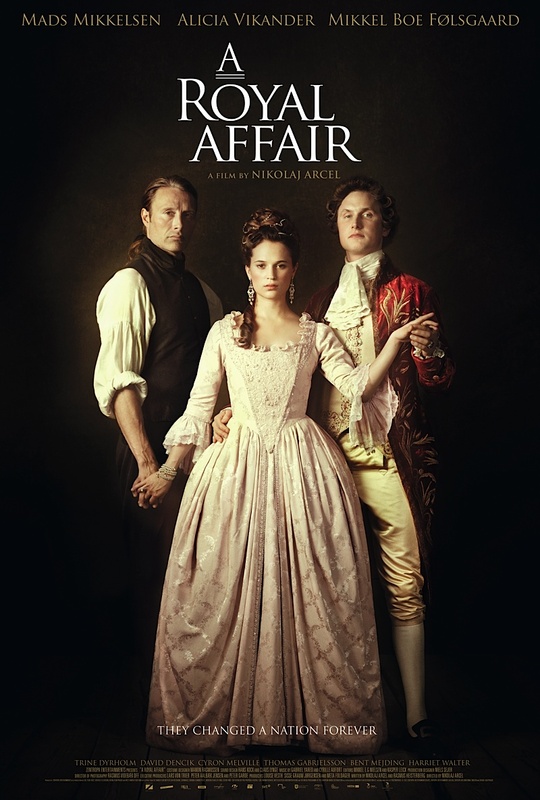 The Danish production "En kongelig affære", or "A Royal Affair", tells said story of King Christian VII, his wife Caroline Mathilde and the royal physician Struensee featuring some very big names (before some of them were big): Mads Mikkelsen and Alicia Vikander. So it won't come as a surprise to anyone that out came a very good film. Frankly even one of my favourite period dramas! "A Royal Affair" isn't a ravishing love story. It's, at times, surprisingly dark and yes, it probably does take a very pro-Struensee view of things. He didn't speak fluent Danish, as suggested in the film, and was thus actually disliked by much of population because they felt the modern reformer did to accept their values and traditions.